Multiple Project Tracking Template Excel Provides a mechanism to manage multiple projects in a single template. 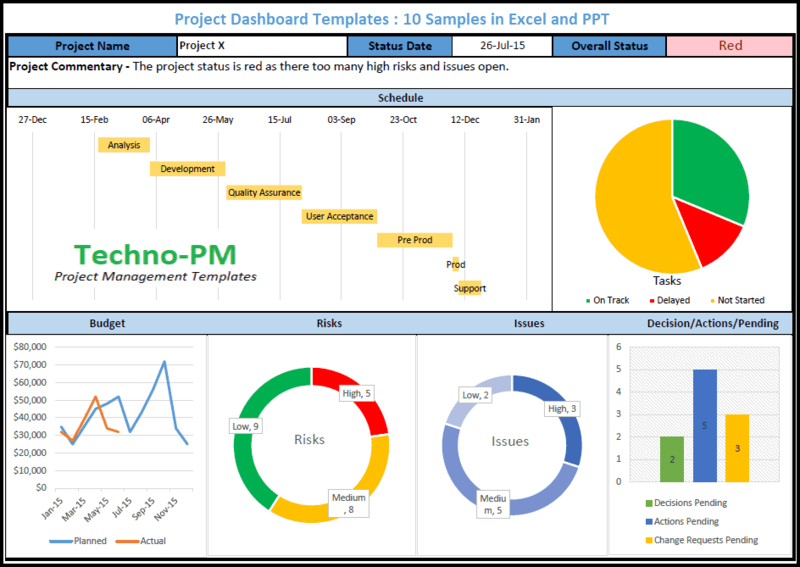 Project Managers can track multiple projects using this template on daily basis. It has become an industry norm for project managers to work on multiple projects. Keeping track of multiple projects is very challenging and having a mechanism to be able to track tasks effectively is key in the whole process. For any project manager working on multiple projects, this should be part of Excel Project Management Templates. Provides a mechanism to track high-level tasks for multiple projects. Easy and simple to use. 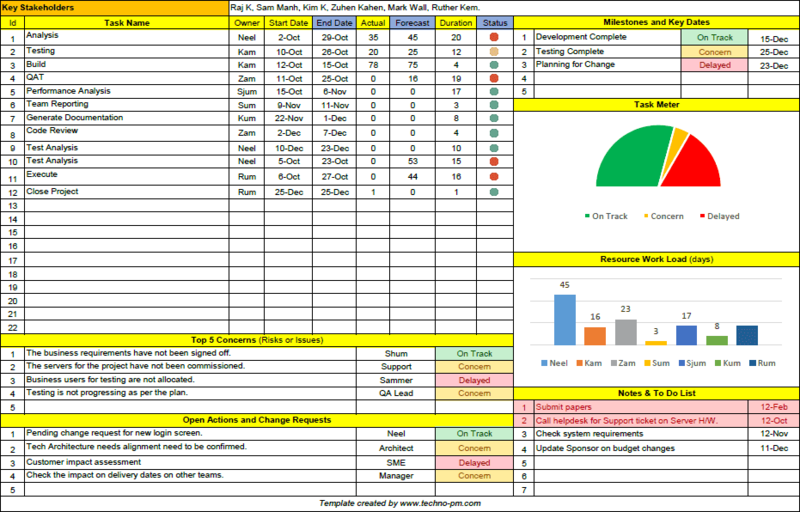 Project Managers can use this multiple project tracking template excel on a daily basis so that they can provide quick updates to their senior management. At any point will give a snapshot view of at least 4 projects. Additional projects can be added and can be viewed by scrolling down. Handles up to 5 phases for each project. You can change project phases as per your need but the same phases will be applicable across all the projects. For each project phase, there is a % percentage complete and comments section. The comments section is useful when there is a need to highlight issues. Tracks up to 4 Key Performance Indicators(KPI) for each phase. Each project KPI has a status 3 statuses - Good, Bad and Worry, Good - when all is good, Worry - when you have concerns about the KPI and Bad - when things have already gone pear-shaped. Provides keynotes and dates section which can be used to highlight and track key dates. Can also be used to document comments. Each key date or comment has a column for date and status. There is also a status column which can be used to display Green, Amber and Red status. Generally, help to convey the status in regards to the date. 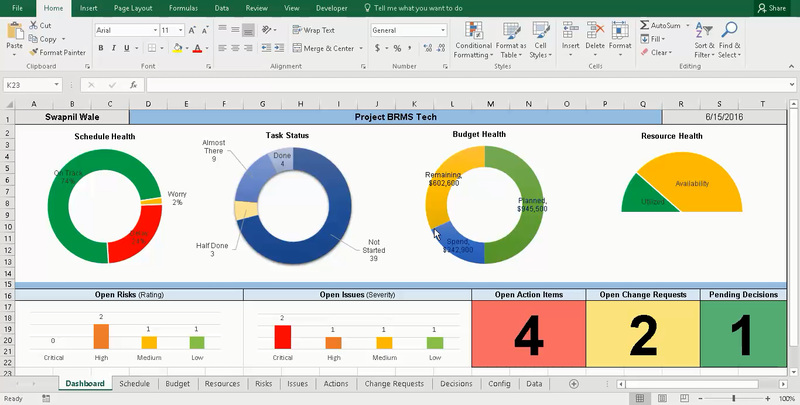 This Project Tracking Spreadsheet is for simple projects and can help a project manager in the task and overall management. This spreadsheet has been designed based on IT Projects but with a little customization can be used for any project. The project tracker is for simple projects which do not need complex project manager software or Gantt charts. The project tracker can help in managing projects which have up to 20 tasks. Suitable for projects which follow waterfall methodology. The Project Tracker has two key sections – The task tracker and timeline tracker. Designed to work with IT Projects so covers different SDLC Phases for each task or component. Each component can be tracked against normal SDLC phases like Analysis, Design, Build, QA, UA, and Implementation. Each component will also have a status column which has 5 different statues. The status can be On Track, Concern, Delayed, De-scoped and On hold. The Progress of each task in the tracker is measured using % complete. On track status should be used when things are going fine, the concern is when things are slowing down a bit and delayed when the task is delayed. De-scoped when the task was started in the project but de-scoped. On hold when for some reason the task has been put on hold. The project timeline provides a view of important or key phases in the project with a start and end date for phase. The timeline also a status column for each phase which is similar to the status for tasks. There is a section for project team details. You can modify the template and use that section for anything you wish. In fact, you can modify any of the sections you want as per the project including the status. The Project Tracking Spreadsheet is easy to use. The only configuration is under the data tab is the task and component status. You can change the status types but the highlighting will stop working as the conditional formatting will stop working,.The particular example used in the article is for a project for website development. The website development project is tracked at two different levels. First, the entire project timeline which is on the right side and has only the high-level components. Each project phases will consist of a number of components. Second, the individual components level where it has different modules like login, home page, integration and other components with tracking status. Managing (or should I say juggling?) multiple projects is not for the faint of the heart but, sooner or later in our careers, we all experience such situations since a) resources are scarce, b) organizations can’t afford to hire additional staff, and/or c) when you are good at what you do, you end up being punished rewarded with more projects. Despite not being able to be dedicated to a single project is nowadays a common scenario, there is not much guidance out there of what to do, thus, today I’m going to give you my hints and tips on how to survive when managing multiple projects. Prioritize your projects: all clients and all projects are equal but some are more equal than others. Don’t simply assume that all projects are important. Check with your PMO (project management office) or Portfolio Board which projects deliver the most value and prioritize your effort accordingly. If there is no portfolio prioritization in place, discuss the issue with your project sponsor and project board. Unless you become an ‘octopus’ project manager, it will be impossible to dedicate the same level of love and attention to all projects equally. Prioritize your own time: don’t despair with your over-allocation, every day is an opportunity to excel. Start the day by planning what it is that you really need to accomplish that day. Use checklists to set your daily goals and find your ‘secret spot’ where you know you will not be interrupted. It is easy to get distracted if you are in a room full of colleagues but sometimes you just need to focus on one thing at a time to get the job done. Also, don’t neglect the power of quick wins: they will keep you motivated and will certainly please your stakeholders. Distinguish between importance and urgency: not everything that is important needs to be done just now. Learn to use your time more effectively by distinguishing between what is urgent and what is important, and manage your time like a president, using the famous principle developed by President Eisenhower. Take care of tasks which are urgent and important first, then urgent but not important. Don’t waste your time with tasks that are neither important nor urgent, you can do them once things are quieter. Manage dependencies: with so much work, it is easy to have things falling between the cracks and, if these things are dependencies between projects, my friend, you have a problem in hands. A useful tool to ensure that all dependencies and impacts are identified and timely managed is a Dependencies Log, which can be supported by a Dependencies Map. A Dependencies Map is a very powerful mechanism to communicate with your team and stakeholders since it visually represents interfaces and points of dependencies between projects. Set up a masterplan: while masterplans and sub-projects are mostly used for managing programs, they can be very handy for managing a set of non-related projects too, particularly if using the same pool of resources. By putting all your project plans under the ‘umbrella’ of a master plan, you will be able to easily flag dependencies, as well as better manage deliverable and the time of the teams, since all data will be centralized in a single place. Delegate: with so much going on, it’s understandable that you want it all to go according to plan but you should resist the temptation to micromanage the work of your team or to do all the work yourself. You already have plenty on your plate, mate! Project managers tend to play superheroes and be the one and only responsible for all mitigation and resolution plans for risks and issues. Please don’t perpetuate that trend. Delegate some of the work to trusted professionals in your management team. Remember, accountability and responsibility are closely linked concepts but they are indeed different. Learn to say ‘no’: pay attention, one of the reasons why you are in your situation in the first place is because you accepted the new project that was assigned to you. Don’t be afraid to say ‘no’. Often project managers are too optimistic and overestimate their own capacity, however, make no mistake: problems happen. Be humble and acknowledge your own limitations and how much you can take on. Ask for help: in some organizations, there are dedicated project support offices (PSO), intended to assist project managers in delivering their projects on time, on a budget, and according to requirements, which typically also include functions of the secretariat. If you are in the need for an extra help, contact your PMO or PSO and request a dedicated support analyst to help you out with all the planning, tracking, and paperwork of the project. Raise it as a risk: a good project manager identifies all the key risks that can impact the project, even if that means suggesting that his/her own availability is a concern. When it comes to risk management, communication is essential. By adding your limited availability to promptly address project issues and manage work as a risk in your current projects, you are not showing incompetence or complaining but rather showing your professionalism and giving visibility over a real problem, in this way setting the right expectations to your stakeholders. Don’t just rely on your memory: it may sound like an additional overhead but, after a couple of meetings, you will soon enough realize how easy it is to mix deadlines and names of suppliers if dealing with multiple projects. Having an effective document management approach is essential to ensure that you are on top of your game. Do not neglect the importance of writing things down! And, most importantly, don’t panic. There will be days better than others, that’s simply how life goes. So don’t panic too much and enjoy the ride. Remember that you have a team to support you and that soon each project will be completed. How do you eat an elephant, they say? One bit at a time!